If you're a long-term reader of My Scandinavian Home - first of all thank you! Second of all, you may well recognise the name 'Alvhem'. 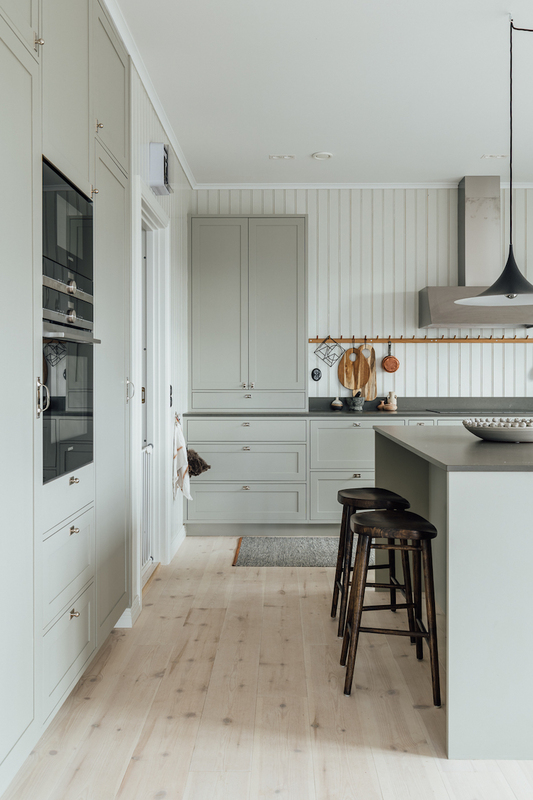 I've been covering homes featured by the Gothenburg-based estate agent for years - mostly because looking through their listings is akin to browsing a Swedish interior magazine! Needless to say, the home of Alvhem's founder and co-owner Sandra Guerrero is equally beautiful! 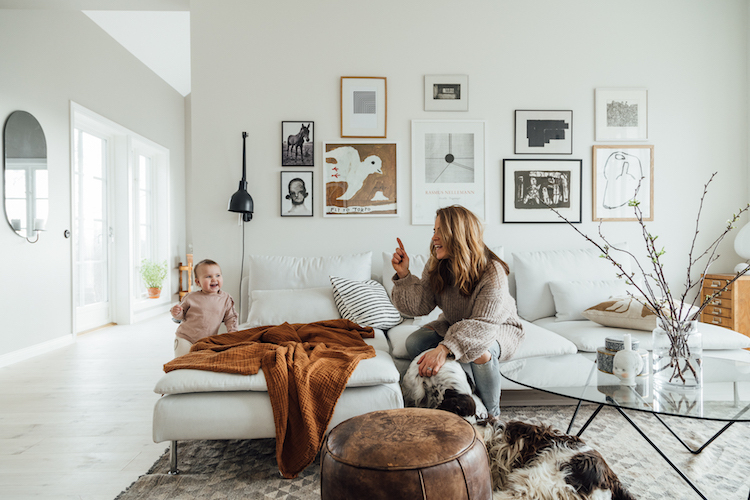 Sandra lives with her partner Martin, their one and a half year old daughter Alma and dogs DJ and Ramón in Halland, West Sweden. With the sea lapping at the shore on one side and undulating meadows on the other, the pair have kept the interior deliberately simple to ensure it doesn't compete with the view. The spacious living area features white washed walls, a wide plank wood floor planks (love it!) and subtle green, grey, cinnamon and dark brown accents. It's time to pour a coffee (I'm on my third - can you tell I've been living in Sweden for a while?!) and take a peek inside! Söderhamn sofa, source similar prints from The Poster Club* (ships worldwide). This waffle blanket* is similar (this cinnamon coloured pillow / cushion* would look fab in this space too). The wall in the dining area has been painted in Washed Linen 10679. I also spy Thonet chairs*and Ant chairs*. DJ and Ramón remind me so much of my childhood Springer Spaniel, Puddles. I miss her - she was such a lovely dog! 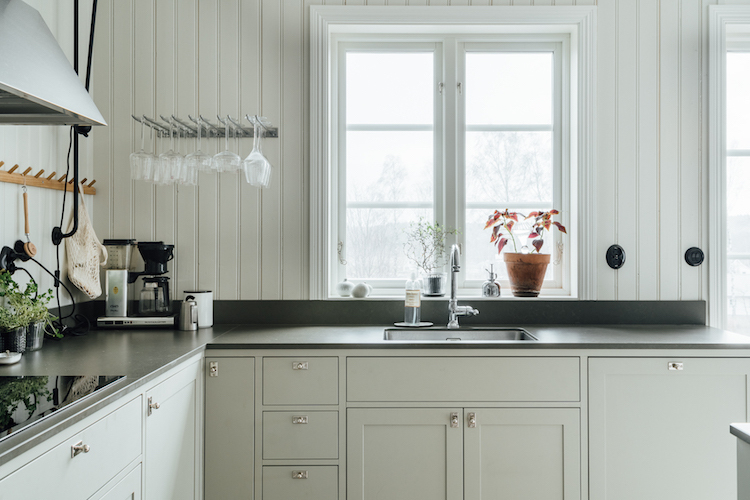 The classic, country-style kitchen cabinets have been painted in Hardwick White by Farrow & Ball. 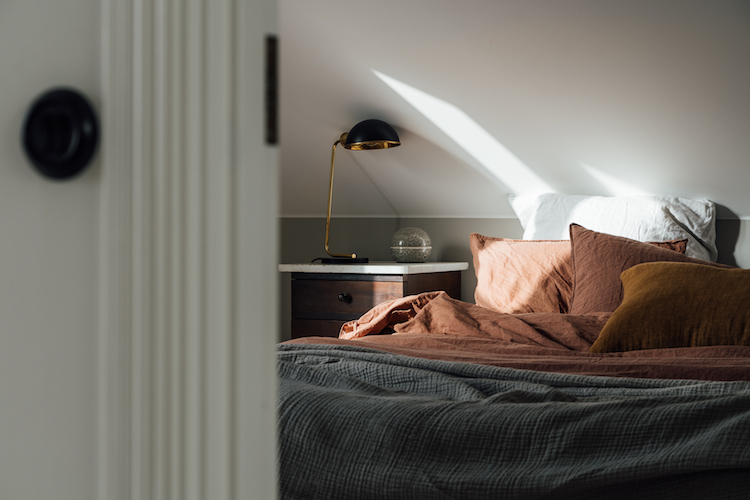 The back wall in the bedroom has been painted in cosy Ascott by Jotun. This brown linen bed set* is similar (dog optional!). Tip: notice how a marble top has been added to a vintage wood side table. 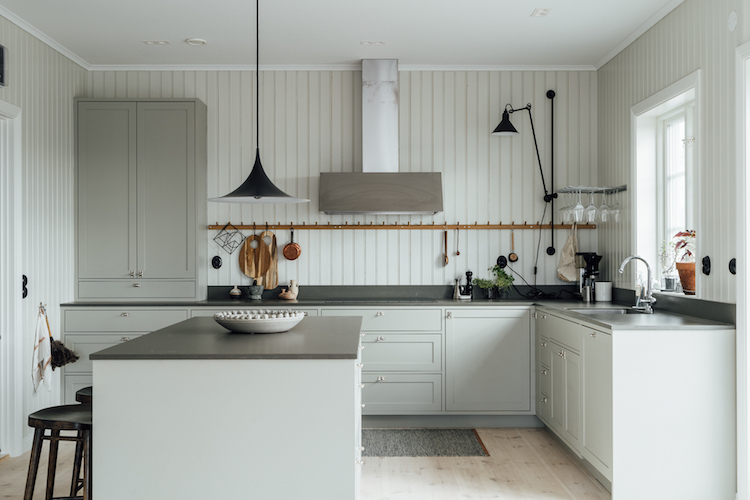 This is a popular hack in Sweden and a great way to update vintage furniture. Check out your local flea market and antique stores for similar furniture and ask a local stone mason to cut a slab of marble to size for you. 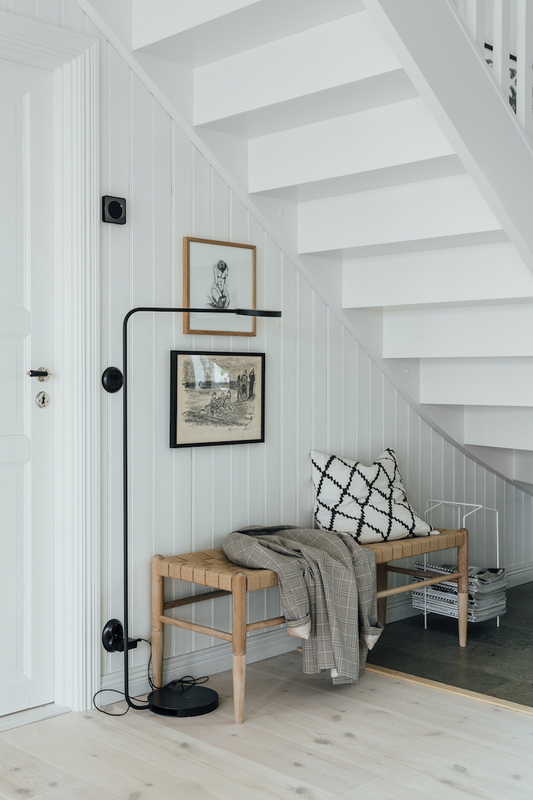 I love the simplicity of this home - it's a look the Scandinavians do so well! Despite everything in the home being incredibly well thought out down to the tiniest detail, Sandra admits that she couldn't resist the wood floor, even though she knew it might get damaged by DJ and Ramón's paws. Such a tricky one. 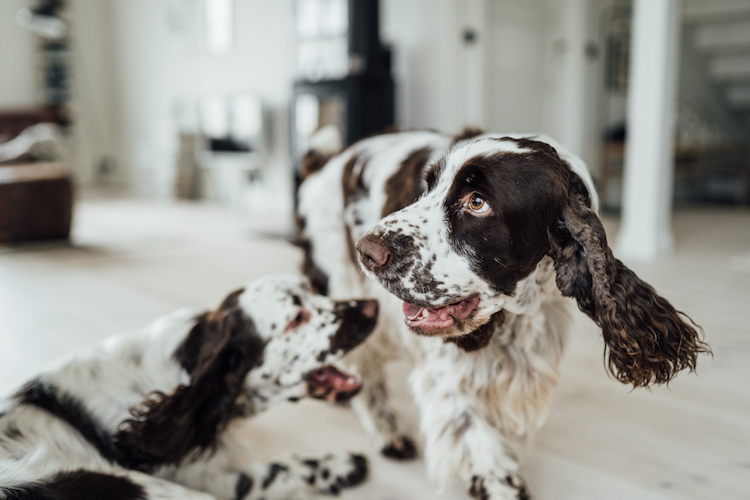 Do you have dogs and experience the same kind of dilemmas? You can see more pictures of Sandra's lovely home and read the full interview over at Alvhem. Happy 'lillördag' (little Saturday) friends! Found via Nordic Design Blog with thanks! PS I had such a wonderful day at the My Scandinavian Home Studio yesterday. Excited to see the first room designs taking shape! My sister seriously regrets her hardwood floors in the kitchen. Her dog has really made a mess of them. My kitchen floor is a very dark cork - in retrospect, maybe the dark colour wasn't the best idea - it really does show everything, but it looks pretty good! We have cats so I guess there are scratches, but I'm fairly relaxed about that. My sister's dog Folly destroyed their wood floor so they've had to go for tiles now. Liking the idea of the cork! 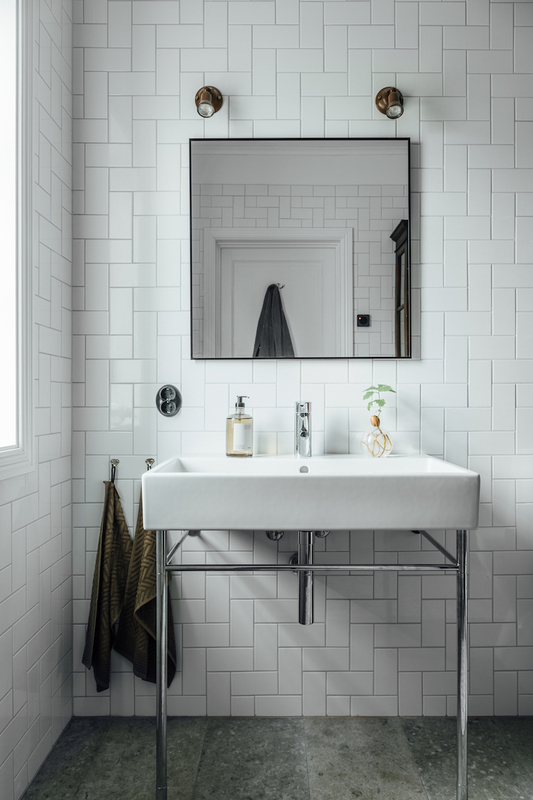 Any idea where to find those lovely bathroom towel hooks or something similar? Hmmm. I am guessing these could have come from Byggfabriken here in Malmö where they do wonderful reproductions of timeless home elements. It's definitely worth trying a large hardware store for something similar. Thank you fo your kind words about my blog! 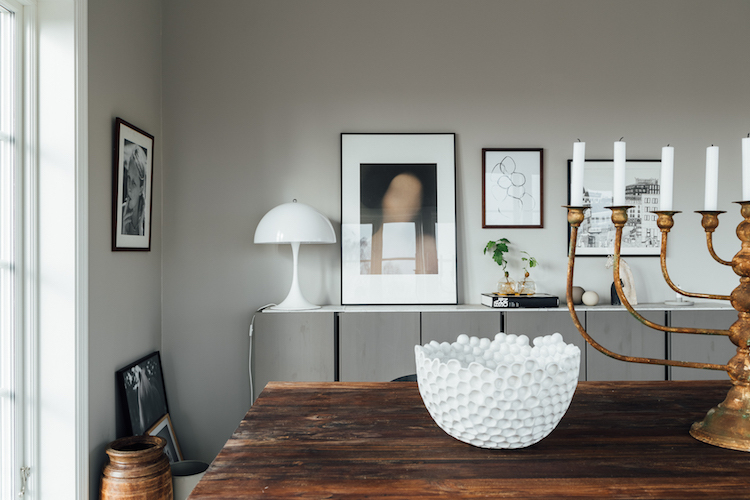 Danish brand Hay do a great rice lamp - or maybe even try Amazon for an extra large one like this. Hope you find something, it looks fabulous!